Q. What kind and type of motor coaches are used for tours and chartered trips? 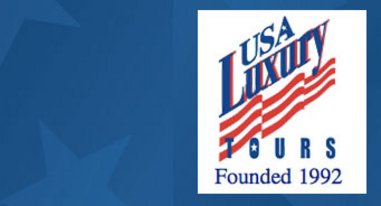 A. USA Luxury Tours uses several carriers that offer a wide and varied fleet of motorcoaches. The most popular transportation vehicles acquired are 55-57 passenger, state-of-the-art motor coaches. Primary coaches acquired are MCI, Van Hool, and Prevost models. Q. Are meals included with tours? A. Although breakfast is sometimes included, normally, USA Luxury Tours feels tours are more affordable if meals are not included. Q. What are some tour destinations? A. Some destinations included in USA Luxury Tour's packages are Toronto, Canada; Montreal, Canada; Dutch Country, PA; Niagara Falls, NY; Chicago, IL; New Orleans, LA; Orlando, FL; Birmingham, AL; Memphis, TN; Oklahoma City, OK; Albuquerque, NM; Las Vegas, NV; Grand Canyon, AZ; Phoenix, AZ; El Paso, TX; Juarez, MX; Dallas, TX; Jackson, MS; Minneapolis, ME; Nashville, TN; Madison, WI and Atlanta, GA, to name a few. Q. How does one go about paying for tours? A. A special, no-interest installment plan is available for each tour. Checks, money orders, and/or cash are acceptable forms of payment. Q. How does one learn about the amenities included with a tour? A. Printed flyers and brochures are designed to provide detailed information about each tour. Also, this web site has been designed to further acquaint prospects with tour information. Travelers always receive a detailed trip itinerary approximately 4 weeks prior to each tour. Q. What happens if a motor coach breaks down during a tour? A. As mentioned above, USA Luxury Tours acquires motor coaches from area carriers with excellent reputations and safety records! Although no equipment is free of "breakdown," motor coaches acquired by USA Luxury Tours are late models which normally ensure a problem-free trip. However, should an emergency occur, the companies used by USA Luxury Tours guarantee repair and/or replacement within a reasonable period of time. All carriers are members of most transportation organizations (NTA, ABA, CLIA, NCMA, UBOA) which guarantee nationwide assistance. Q. What if a personal emergency occurs before the trip and I am unable to travel...will I get a refund? You have a 30 day grace period from the time of your initial deposit to cancel your reservation without penalty. Also, failure to make scheduled payments may result in cancellation of your reservation. Otherwise, the only way to receive a full cancellation refund is to obtain a replacement. If the trip is canceled by USA Luxury Tours, you will receive a full refund! Q. What if you would like to stay in a room alone? A. You may stay in a room alone. However, the trip price is based on double occupancy. To stay in a room alone would result in an increased cost. We encourage passengers to travel with a spouse or friend, to lower the price. You may also sleep three to a room if your choose, but your cost will be the same as for double occupancy. Q. How do I get on the mailing list? A. Anyone who has traveled on a pre-arranged tour or chartered a bus through USA Luxury Tours, is automatically placed on our mailing list. However, if you are not on that list, simply call, e-mail, or write requesting that your name be placed on the list. Being on the mailing list entitles you to receive USA Luxury Tours annual newsletter, a publication designed to make the public aware of all company tours. Q. In what community activities does USA Luxury Tours participate? A. Since its inception, USA Luxury Tours has supported several non-profit, community organizations. However, because we believe that every business has a civic responsibility to "give back," USA Luxury Tours has established a scholarship and charity fund. The primary purpose of this fund is to provide worthy high school and college students and non-profit organizations with financial assistance within the organization's capacity to do so.